Our practice is dedicated to helping patients of all ages recover from orthopedic conditions of all kinds, including knee, shoulder, and spine conditions. Dr. Czarkowski has extensive training and experience with knee and shoulder injuries and arthritis, including joint replacement surgery. No one in the Indianapolis area can match Dr. Czarkowski’s expertise in sports medicine, including arthroscopy for injured athletes who need to get back in the game quickly. When you’re hurt or in pain, you shouldn’t have to wait 30 minutes for a doctor who will spend less than 15 minutes with you. In our orthopedic office, we make sure you get quality time with the doctor without having to wait forever. No rushed appointments and most patients wait less than 5 minutes! Time is valuable to all of us, and so is getting high quality medical care from an orthopedic surgeon in Carmel, Indiana who truly knows what you need. In practice since 1987, Dr. Robert Czarkowski has over 25 years of experience with work injuries, sports injuries, arthritis, and spine treatments, making him an excellent choice for patients of all ages. You can trust his recommendations and advice as your personal orthopedic surgeon. We also specialize in arthroscopy and knee and shoulder replacement surgery. If on-time appointments and a reputation for excellence in orthopedics are important to you, then Robert A. Czarkowski is the doctor for you. Our goal is to help you feel your best by managing your pain and providing treatments that promote healing for all kinds of orthopedic conditions and injuries. To see Dr. Robert Czarkowski for orthopedic treatment, please call (317) 564-4037 or use our easy appointment request form while you’re on our website right now. Want to learn more about a condition or treatment you’ve heard about? 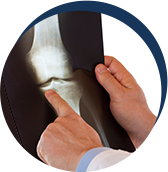 Browse Dr. Czarkowski’s interactive online library of orthopedic education materials. Copyright © 2018 Robert A. Czarkowski All rights reserved. Carmel orthopedic specialist conveniently located on the north side of Indianapolis in Hamilton County, Clay Township across from St. Vincent Carmel Hospital off North Meridian Street & Guilford Rd. We serve Noblesville, Fishers, Westfield, Cicero, Zionsville, Lawrence, Pike Township, Washington Township and surrounding areas of Indy. As a St. Vincent Sports Performance affiliated physician, Dr. Robert Czarkowski specializes in general orthopedics, sports medicine, joint replacement, spine and arthritis treatments. Dr. Czarkowski treats children, teens, adults and seniors who suffer from back & neck pain, knee pain, shoulder pain, or chronic joint pain from general orthopedic conditions such as sprain, strain, overuse injury, tendonitis, shin splints, auto accident or job related injury to more complex musculoskeletal problems that may require surgery. These may include fracture (broken bone), osteoarthritis, herniated disc, slipped vertebra, pinched nerves, degenerative joint disease, scoliosis, torn ligaments and tendons, cartilage tears or rotator cuff tear. Voted Top Doctor by Indianapolis Monthly Magazine every year!